John Deere remains the most popular tractor brand in the UK. The latest figures from the association reveal that 1,437 tractors over 50 horsepower (hp) were registered in Scotland in 2018. This is down slightly on 2017 when 1,447 tractors were sold. The AEA said Scottish registrations represented 11.9% of total UK registrations, which stood at 12,102 in 2018. This is up 1% on 2017. The regions with the biggest increase in sales were the East Midlands and north-east of England, with registrations up 31.7% and 19.3% respectively. The regions with the biggest decline in sales were the south-east of England and the Channel Islands, and eastern England, with registrations down 10.8% and 7.4% respectively. AEA agricultural economist Stephen Howarth said: “Growth in registrations (across the UK) was primarily at the top end of the power range. “Over 600 more tractors over 180hp were registered in 2018, an increase of 18%. 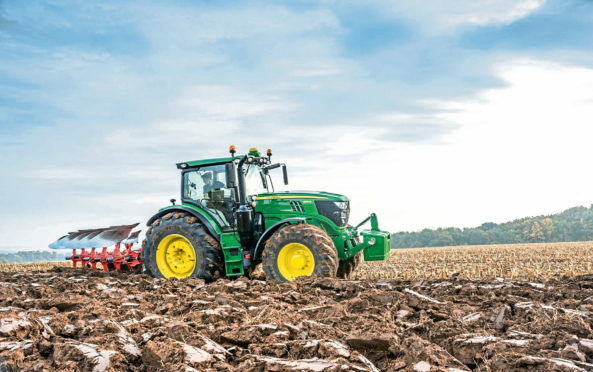 Meanwhile, the latest brand-specific sales data saw John Deere remain the tractor manufacturer of choice among farmers and crofters in the UK. The figures, which cover 2017 when 13,768 tractors were sold, show John Deere accounting for 28.4% of total sales that year. The second most popular brand was New Holland, representing 15.8% of sales, closely followed by Massey Ferguson at 14.3%. Sales of Case tractors represented 7.5% of the market, followed by Fendt at 7.2% and Kubota tractors at 6.5%. Valtra tractors accounted for 4.5% of the market, while sales of Claas and JCB represented 3.5% and 2.4% of the market, respectively. Sales of McCormick, Landini and Zetor tractors represented a small share of the market at 1.4%, 1% and 0.7% respectively.